This was a paper hastily whipped together, some years ago, to be able to send an abbreviated background paper to correspondents. The history prior to this paper runs from Hamilton and his quaternions to Maxwell and his quatemion theory, to Heaviside’s vector curtailment of Maxwell’s theory, to Nikola Tesla, to Whittaker, to Einstein and relativity, to Kaluza and Klein, and to the beginning of quantum mechanics. We begin our history in 1939 at T.H. Moray’s lab in Salt Lake City. In that year, a Russian agent obtained detailed drawings of Moray’s specialized amplifier which extracted energy from the powerful quantum mechanical fluctuations of vacuum. Moray’s radiant energy device weighed 55 pounds and produced 50 kilowatts of power without conventional input. Numerous demonstrations are documented by engineers, scientists, and community leaders. After extensively testing Moray’s device and obtaining the drawings by subterfuge, the Soviet agent destroyed the device. Moray, a truly great pioneer who was unjustifiably ignored in his time, had expended several hundred thousand dollars and exhausted his funds on the first unit. He was never financially able to rebuild it. 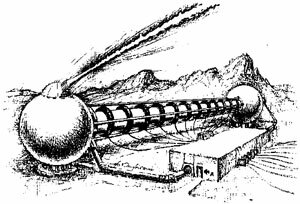 Thus in 1939 the Soviets obtained the secret, detailed drawings for a 29-stage electromagnetic device far ahead of its time. Moray had made the first germanium transistor, an amorphous pellet of multiple, finely powdered ingredients, sintered under heat and pressure to lock-in stress, and containing minute interfaces (very tiny built-in cracks) which acted as tiny scalar EM interferometers. Over the years Moray (right image) had painstakingly constructed 29 special tubes, each comprised of a blown quartz envelope containing several (usually three) of his transistor pellets. Only one in 300 of Moray’s tubes would work, and thousands had been built to obtain the 29 good ones used in Moray’s radiant energy amplifier. Each of Moray’s pellets in the tube produced a vacuum state far from thermodynamic equilibrium, and the tri-assembly functioned as a macroscopic scalar interferometer and collector. Moray’s 55-pound amplifier curved local spacetime and produced 50 kilowatts of usable load power from the curved vacuum source itself. Additional power could be taken from intermediate stages as well. In short, Moray had produced a "Prigogine" transistor, still slightly more advanced than the transistors of today. [Ilya Prigogine received the Nobel Prize a few years ago for developing a new thermodynamics of systems far from thermodynamic equilibrium. Negative entropy is possible in such a system.]. Greatly stimulated by Nikola Tesla’s repeated pronouncement that the ether was a sea of energy, Moray had painstakingly developed his special transistors, and arranged an assemblage of them to form a scalar interferometer and collector of the disintegrated "energy" (virtual particle flux) of vacuum, integrating it into real observable energy fed to a load. Some day Moray, together with Tesla, will be recognized as the first great scientific geniuses who succeeded in engineering scalar electromagnetics, electrogravitation, local general relativity, and Prigogine’s new thermodynamics. So in 1939 detailed drawings of Moray’s unit were obtained and forwarded to Russia, along with details of experiments that the Soviet agent performed with the device in Moray’s laboratory. Moray’s lab still stands in Salt Lake City, Utah, operated by his son, John Moray, who has faithfully carried on his father’s work. However, in 1939 World War II was looming ominously on the horizon. Japan had started her expansive march in the Far East in 1931. In Germany, the Nazi Party and Adolf Hitler had risen to power in 1933. Italy had moved against Ethiopia in 1935-1936. From 1936 to 1939, Italy, Germany, and the Soviet Union were unofficially involved in the Spanish Civil War, testing weapons for a wider new conflict in the future. The Sino-Japanese War in China (1937-1942) was proceeding. Germany had seized Austria and most of Czechoslovakia to the dismay of the West. Thus in the cataclysmic events of 1939-1940, a Russia looking full in the face of a Nazi threat and raging war in Europe had little time or inclination available to pursue the bizarre, puzzling drawings and notes obtained from Moray’s lab. The pace of events in Europe continued inexorably, occupying all the energy and attention of the Soviet Union. In attempting to sidestep attack by Hitler, Russia had signed a Nonaggression Pact with Germany in August 1939. Consolidating her position, Russia had engaged in a stubborn, bloody war with valiant little Finland from November 1939 to March 1940, suffering heavy casualties and leading Hitler to conclude that Russia was militarily weak. In April 1940 Germany had occupied Norway and Denmark, and in May-June 1940 German armies had disastrously routed the British and French at Dunkirk. As 1940 wore on, Hitler had moved into Romania, Bulgaria, Yugoslavia, and Greece. A beleaguered Russia signed the Soviet-Japanese Neutrality Pact of April 13, 1941 so that Japan would not pin Germany in striking the Soviet Union. By early spring of 1941, German attack on Russian forces was imminent, with daily overflights of Russian lines and probing incidents. However, during the war the U.S. developed the atomic bomb in a feverish and highly secret technical effort. During the Potsdam conference, the U.S. exploded its first atomic bomb in the New Mexico desert. At the conference, Stalin was informed of the bomb and its first successful test by Truman, who had replaced the deceased Roosevelt as U.S. President. An impassive Stalin showed no apparent concern, but inwardly he knew that his secret plan to conquer Europe a year or two after the war—by which time the West would have beaten its swords back into plowshares—now had to be abandoned. A short time after, the U.S. dropped two bombs on Japan by stunning surprise. Faced with total and certain annihilation, the heretofore fanatical Japanese capitulated. He informed his scientists in no uncertain terms that the next such breakthrough had better be Soviet. He planned to do exactly what the U.S. had done: Find a new area for a great technical breakthrough and super-weapon, put the entire resources of the nation behind it, develop it in great secrecy, and thrust it upon the U.S. and its allies at the eleventh hour. The West would then be forced to capitulate, just as was Japan. We had already shown Stalin the successful scenario by which to win the next war. Ironically, Stalin’s "great technical breakthrough" was to come from Germany’s radar scientific team, taken to the Soviet Union after the war. This team had drastically advanced the theory of radar cross section and radar absorbing material (RAM). They were on the verge of discovering phase conjugate time reversed radar waves—which would enable the great new super-weapons Stalin sought. Meanwhile, the Soviets plotted a delaying campaign until they were ready to strike the West. Furious action was required to catch up to the U.S. in atomic weaponry. Obviously it was only a matter of time until long range rockets, as evidenced by the German Vl and V2, would be mated to atomic warheads, thrusting the decisive role of artillery into the strategic arena, far beyond the wildest imagination of then-current thinking. Also, air defenses against the American and British bombers were desperately needed. Guided rockets capable of shooting down American bombers enroute to critical Soviet areas were am absolute necessity. Atomic warheads were needed against massed bomber fleets, as had been thrown against Germany during the war. The Soviet state must launch a superhuman effort to rapidly achieve its desperately needed missiles and atomic weapons, for it was totally vulnerable until that had been achieved. Meanwhile, the old methods that had proven so effective when one cannot fight a stronger foe head-on— guerrilla warfare, insurgency, and terrorism—must now be massively employed on a global scale to focus the attention and physical exertion of the U.S. dragon elsewhere. Third party "wars of attrition" would threaten American interests around the globe, and U.S. forces would be siphoned off in debi1itating struggles against guerrilla wars and in distant lands. These sapping wars would "bleed the dragon" and weaken it, while the Soviet Union prepared a special technical sword with which to administer the final coup de grace. Stalin was an absolute dictator, brooked no opposition, and killed his opposition. Knowing what was good for them, the Soviet Academicians did not dare to debate or protest against his ultimatum to search every field of knowledge, no matter what. Instead, Academy scientists vigorously turned to a massive search for the new breakthrough area. Scientific literature from the West was hauled to Russia by the shipload. Thousands of Soviet PhDs and engineers were put to work in huge analysis institutes, sifting through the literature and digesting it—and carefully noting anomalies and areas which should be followed up. * From this search it seems clear that the Soviet discovered Whittaker’s 1903 and 1904 papers also prescribing the engineering method. Two short years after WWII, Soviet planning for Stalin’s new thrust was finalized, and the cold war was launched around the world. A great dialog began among the leading Soviet military leaders to hammer out radically new strategy for utilization of new weapons of mass destruction. Feverish effort to develop and deploy the first defensive missiles was underway, as was a crash effort to develop long range ballistic missiles, large bombers and atomic weapons. At the time, German and Soviet radar scientists probably began to discover—and puzzle over and work out the theory and hardware for time reversed EM waves and phase conjugate mirrors. The Moray drawings (and related agent reports) must have been resurrected. Nikola Tesla’s notes, taken from his hotel room at his death in 1943 and later turned over to Yugoslavia, must have passed into Soviet hands also. Soviet espionage was quite successful in easing the task of developing atomic weapons. Soviet rocketry, funded and staffed massively, forged ahead, particularly in big rockets and solid propellants. The great postwar arms race was on, so far as the Russians were concerned. Several years after WWII, then, the Soviets should have been embarked on experimentation with a Moray prototype amplifier. They should have been deeply involved in time-reversed EM wave experimentation to rediscover what Tesla actually had done in wireless transmission of energy without loss. Also, the earlier Kaluza-Klein unified electromagnetics and gravitation theory (1921-1926) could not have eluded the Soviet scientists, who have consistently led the world in nonlinear mathematics. Of necessity, the search for a new breakthrough area would have initiated intensive review of the foundations of physics and electromagnetics, in an effort to discover any "holes" that might exist. Thus the short debate at the turn of the century, that established Heaviside’s limited version of Maxwell’s EM theory—largely because of Western repugnance for Maxwell’s use of Hamilton’s difficult quaternions— would not have gone undetected. (1) Maxwell’s theory, which was worked out in quaternions rather than vectors, had actually not been completely captured by its translation into Heaviside’s vectors by none other than Heaviside himself. [Heaviside was the cofounder of modern vector analysis and almost single-handedly produced what today is the recognized vector form of Maxwell’s equations. He also nearly single-handedly transformed Maxwell’s theory into its modem form.]. (2) The effects of stresses in the vacuum medium had been eliminated by Heaviside, while Maxwell certainly had pointed out additional terms required to address this issue. [A Soviet team addressing this omission, would have inevitably connected it to Whittaker and Kaluza-Klein theories, revealing electrogravitation (scalar electromagnetics).]. (3) A quaternion, which contains a scalar part in addition to a vector part, could maintain ** its non-zero scalar part when the vector was zeroed, whereas in vector analysis, when the vector is zeroed, it is assumed that no residue exists. ** and even vary and oscillate, its internal EM stress. (5) The West had missed this unified theory because of its total aversion to quaternions, and its elevation of the curtailed Maxwell’s theory to cult status. (6) Investigative experiments to explore bucking EM force fields which neatly zero sum would have almost immediately revealed highly anomalous behavior of materials and circuits. *** with the single exception of the Aharonov-Bohm effect, which has finally been proved after 27 years of controversy, and Hooper’s work which was obscurely published. Something very much like that, together with quantum mechanical ideas, would have had to be applied to explain the operation of the Moray device. Note that every one of the suppositions above was available to any thorough Soviet search—and the Soviet scientists certainly made the search, more massively and thoroughly than has ever been done before or since. Since the evidence is overwhelming that the Soviet scientists developed electrogravitation and scalar EM weapons, it seems logical that their search succeeded along these lines or similarly. About 1950-1952, the Soviets developed EM machines that could influence the brain and nervous system directly. This included the Lida machine, which can induce a catatonic state into a mammal such as a man, a cat, etc. U.S. scientists, obtaining one of these devices in the 1980s, reported that it utilized a 40 MHz carrier, and produced unusual waveforms (showing the multiple frequency content). Since the U.S. scientists do not possess scalar EM detectors, they have no measurements or knowledge of possible scalar components in the Lida’s output signal. According to one U.S. scientist, the device was used by North Korean interrogators in brainwashing U.S. prisoners in North Korea during the Korean War, and was highly effective. In the winter of 1957-58, a monstrous nuclear accident occurred at a Soviet facility in the Ural Mountains near Kyshtym (see below images). [Inexplicably, for decades U.S. intelligence analysts feverishly resisted—and even suppressed—the evidence in their possession, adamantly insisting that such an event never occurred.]. Witnesses reported that atomic wastes in the nearby storage site exploded. Since scalar EM research and development would have been underway in the Soviet Union for several years, we can construct a scenario that will produce that nuclear event: Suppose a large nearby radar had been modified to radiate a scalar EM wave. Suppose it is also used to produce a standing scalar EM wave, after Whittaker. eventually caused the eruption of one of the Chernobyl reactors by EGP-pulsing its nuclear fuel rods. by the safety circuits of the disabled transmitter. These circuits finally gave way, producing a mild EGP pulse into the earth. Had they failed immediately, all four reactors at Chernobyl would have violently exploded. As the radar continues to radiate, such a standing scalar EM wave is "charged up" to a higher and higher "potential", just like charging a capacitor. That is, in the standing wave, its "locked-in energy density of vacuum" is being steadily increased, simply by continuing to transmit with the radar in the scalar EM mode. However, what is actually being "charged up" or produced is a gravitational potential standing wave (and this G-potential is increasing.) Further, suppose the radar and its attached standing scalar wave (G-potential) are energized, and suddenly the radar transmitter suffers an electrical failure. The "scalar potential" represented by the charged-up vacuum energy (which can be enormous) in the standing wave would immediately discharge to earth in a sharp electrogravitational pulse (EGP). When a strong EGP pulse— which is absorbed by, and reradiated from, atomic nuclei rather than orbital electrons—struck stored radioactive nuclear wastes, the radioactive nuclei would all decay immediately, just as if internally exposed to an atomic bomb. A full nuclear explosion of the stored nuclear wastes—in the dirt and dirty—would occur, creating a terrible nuclear "accident." That is exactly what caused the Kyshtym accident in 1957-58. Failure of a large scalar EM transmitter produced a giant EGP "arc discharge" into the earth, striking the atomic wastes stored nearby (see above images). The resulting explosion and radioactive fallout contaminated a very large area, which is still contaminated to this day. Hundreds—perhaps thousands— of casualties resulted. So we can be confident that, in 1958, the Soviets were already experimenting with large scalar EM Whittaker beam weapons. We can also be confident that, after the Kyshtym disaster, the Soviets immediately realized the cause of the accident, and developed safety circuits to hold the standing wave from collapse in the event of electrical failure of the transmitter. Means to slowly "drain off" the accumulated EG potential safely into the earth—much like slowly discharging a capacitor—would also have been developed and incorporated into the beam transmitter. Anomalous microwave radiation of the U.S. Embassy in Moscow began during the late 1950s, and has repeatedly occurred to this day (see below image). Twin beams have been noted in the radiation, suggesting interferometry. Scalar EM components on the carriers would not be detected by normal microwave instruments, although the weak carrier signals would. Further, the strength of the scalar EM wave’s infolded components can be essentially independent of the strength of the carrier. Apparently a wide variety of physical effects were experienced by personnel in the Embassy, including several U.S. Ambassadors. [Note that extensive tests of the electromagnetic transmission of cellular disease patterns between cell cultures have been reported by Soviet researchers, led by Kaznacheyev. Kaznacheyev reported (see below image) that the effects were due to near-UV photons emitted by the diseased cells and irradiating the test cells. Such effects have been replicated at the University of Marburg, West Germany, using infrared emissions from diseased cells to irradiate test samples. * Dr. Fritz Popp has discovered the virtual-state (i.e., scalar EM!) master control communication system for the cells in the human body (see below image). The "Moscow radiation" has represented an intelligence probe for all these years: radiating a high-level U.S. target—the U.S. Ambassador to the Soviet Union—and inducing physical effects assured the involvement of high U.S. governmental agencies and official, including the CIA, DIA, NSA, the National Security Council, and the President. ** For a full explanation, see T.E. Bearden, Gravitobiology: A New Biophysics. Aug. 1989. On May 1, 1960 Soviet defensive radars—rigged as prototype scalar EM beam weapons—probably downed Francis Gary Powers’s high-flying U-2 reconnaissance plane over the Soviet Union, precipitating a major diplomatic incident. At the time, no Soviet surface to-air missile could reach the high-flying U-2, but of course it was extensively tracked on Soviet defense radars. Powers reported that a flash occurred behind his plane and persisted—almost certainly the signature of time reversed wave real-time holography. Eisenhower first denied, then was forced to admit, the photo-reconnaissance nature of Powers’ mission when Khrushchev revealed that the Soviets had captured Powers alive. Khrushchev then cancelled a major summit meeting with President Eisenhower. Powers was imprisoned, and released in February 1962 in exchange for Rudolf Abel, a convicted Soviet spy. *** Penkovsky knew nothing of the Soviet Weapons program in energetics, using time-reversed EM radar wave weapons. Accordingly, as soon as his new superweapons were deployed and ready, Khrushchev did that "something dramatic." On April 10, 1963 he destroyed the U.S.S. Thresher (below image) with one of his new weapons. Scalar EM (electrogravitational) beams, focused through the ocean to interfere on the Thresher under the surface, recreated spurious EM energy in the sub’s electrical control circuits, jamming them so that the sub lost control, sank to crush depth, and imploded. The death of the Thresher was Khrushchev’s first blow. The next day, April 11, 1963, Khrushchev struck his second blow. Two deployed Soviet scalar EM weapons fired massive scalar EM pulses through the ocean. The two massive pulses met and interfered deep under the surface, 100 miles north of Puerto Rico. The resulting giant underwater EM explosion hurled a mushroom of water half a mile up into the air, and the anomalous explosion was observed (and later reported to the FBI and the Coast Guard) by the pilot and crew of a US. Jetliner passing nearby, enroute from Puerto Rico to Florida. Thus we know the year—and indeed probably the very month—that Khrushchev’s new "fantastic weapon" was deployed: April 1963. In the 1960s, Curtis detected a previously unknown, anomalous, weak electromagnetic radiation pattern over the ocean. This is the type of pattern consistent with the introduction of scalar signals with a small’ impure normal EM component or residue. Such cruder implementation would have been expected early-on in the Soviet program. On June 17, 1966 from the air near Teheran, Iran, several airline pilots sighted a brilliant sphere of light (click right image), "sitting on the horizon," so to speak, deep within the Soviet Union. The intensely glowing sphere expanded to enormous size, dimming as it expanded, always remaining "sitting on the horizon." The pilots observed the phenomenon for 4 to 5 minutes. A CIA report on the incident was released under the Freedom of Information Act. In 1967-68, anomalous holes appeared in clouds over the U.S., possibly associated with the beginning of early Soviet weather engineering over the U.S. (below image). That winter was particularly severe. In the late 1960’s, Lisitsyn reported that the Soviets had broken the "genetic code" of the human brain (see below image). He stated the code had 44 digits or less, and the brain employed 22 frequency bands across nearly the whole EM spectrum. However, only 11 of the frequency bands were independent. This work implies that, if 11 or more correct frequency channels * can be "phase-locked" into the human brain, then it should be possible to drastically influence the thoughts, vision, physical functioning, emotions, and conscious state of the individual, even from a great distance. * To translate this to VHF or radar/radio frequencies, see Bearden, Gravitobiology, 1989. (2) such a 10-Hz signal has been demonstrated by Beck, Rauscher, Bise, and others to be able to physically entrain or "phase-lock" the human brain, if stronger than the Schumann resonance of the Earth’s magnetic field. A human brain entrained by a common, phase-locked 10-Hz modulation on 16 carrier frequencies would effectively have 16 frequency channels phase-locked into it. The potential for using the Woodpecker transmitters to phase-lock an appreciable percentage of human brains in a targeted area, and then induce effects in the populace similar to— and even more drastic than—the effects induced in U.S. Embassy personnel in Moscow, should be strongly pointed out. Coupled with the Kaznacheyev work on EM transmission of cellular death and disease, using the Woodpecker signals to induce death and disease in the targeted populace may also be a distinct possibility. Modification of DNA/RNA—and viruses themselves—is also a possibility. Biological Warfare. 1988. Repeated presentations on the Soviet scalar EM weapons and their testing have been given at national symposia since 1978. The exact mechanisms utilized by these superweapons have also been given. A complete and consistent series of many anomalous events exists over the years, showing the continuing development, testing, and deployment of massive scalar EM weapons by the Soviet Union. The exhausts are often in jets 150 miles long and nearly horizontal (about a degree and a half in elevation). They have been photographed coming from Bennett Island and the sea nearby, since 1974. In June 1975, Brezhnev called for a ban on weapons of mass destruction more terrifying than nuclear arms. He stated the need for an "insurmountable barrier" to the development of such weapons. In July he repeated his strange proposal to a group of visiting U.S. Senators. Ponomarev, a Soviet national party secretary, again raised the same issue to a delegation of visiting U.S. congressmen in August. At the United Nations’ thirtieth Session of the General Assembly on Sept. 23,1975, Foreign Minister Andrei A. Gromyko strongly raised the same issue, warning that science can produce "ominous" new weapons of mass destruction. He urged that all countries, led first by the major powers, should sign an agreement to ban the development of these unspecified new weapons. He even offered a draft, entitled "Prohibition of the Development and Manufacture of New Types of Weapons of Mass Annihilation and of New Systems of Such Weapons." The first article provided that the types of these new weapons would be "specified through negotiations on the subject." By its fixation on nuclear weapons and its ignorance of scalar EM, the West may have lost its only opportunity to prevent the spread of scalar EM weapons "more frightful than the mind of man has ever imagined," to use Brezhnev’s characterization. In July 1976, communications around the Earth were interrupted by the sudden emergence of powerful Soviet transmissions in the communications band, from 3-30MHz. The chirped signal produces a characteristic sound in a receiver similar to a woodpecker’s beak hitting a wooden block. The transmitters were immediately dubbed "woodpeckers", and the signals "woodpecker signals." The Western intelligence community dubbed these giant transmitting systems "over-the-horizon radars." These powerful systems were brought on full deployment and activated after the Soviets decided to go ahead with a decade-long buildup to prepare to dominate the earth. That decision was reached after Brezhnev’s 1975 failure to obtain world agreement banning development of scalar EM weapons. Activation of the giant Soviet Woodpecker weapon systems meant that the Soviet Union now would deploy massive scalar weapons on an unparalleled scale. On July 28, 1976, a great earthquake destroyed Tangshan, China, killing some 600,000 persons. Just before the first tremor in the early morning, the sky lit up like daylight, with multi-hued lights seen up to 200 miles away. Electrical signals were also associated with the quake. Note that, in 1912, Nikola Tesla stated in an interview that it would be possible to split the planet, by combining vibrations with the correct resonance of the earth itself. "Within a few weeks, I could set the earth’s crust into such a state of vibrations that it would rise and fall hundreds of feet, throwing rivers out of their beds, wrecking buildings, and practically destroying civilization. The principle cannot fail..."
Later in 1976 Soviet scientists increased the power of the giant transmitters to perhaps 40 megawatts each. The scalar EM power contained in the normal EM carriers is unknown. Transmitting pulses at about 7 Hz, it appears that enormous standing waves were inadvertently set up in-phase in the atmospheric duct around the earth. That is, the powerful carriers were circling the earth about 7 times per second, coming back around in phase with the previous loop. The scalar content also was in phase. The in-phase scalar component apparently produced the phenomenon of "kindling"; i.e., of "charging up" the loop with Whittaker (1903) gravity potential. This potential was perfectly in phase with the cavity resonance of the earth-ionosphere, and so the liquid-filled crustal features of the earth and the ionosphere coupled to it. In short, the potential became self sustaining, and increasing as long as the transmitters kept pouring in carrier power. The result was giant standing waves of totally unsuspected magnitude. The frightened Russians hurriedly turned off the transmitters, but were then faced with an undamped, sustained oscillation of the giant potential. Thoroughly frightened, the Soviets radiated intense bursts of power at the waves, trying to break up their coherence. According to one source, these waves lasted several months under that bombardment before gradually dissipating. 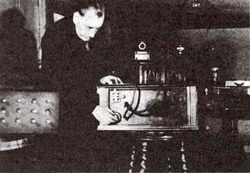 Note that experiments by Dr. Robert Helliwell at the U.S. Antarctic research camp known as Siple Station has shown fairly conclusively that radio waves can be magnified up to 1,000 times or more in the ionosphere, according to reports in the open literature. On September 10, 1976, the crew and passengers of British European Airway Flight 831, over Lithuania enroute from Moscow to London, observed an intensely glowing, stationary ball of light above the clouds underneath the plane. When alerted by the airline pilot, Soviet authorities on the ground curtly informed him to pay no attention and, effectively, to exit the area. This Soviet reaction indicates that the incident may have been a Soviet test of an unknown type of device—in short, a scalar EM interferometer. If so, the interferometer intersection zone was deliberately placed near the aircraft to stimulate the crew and passengers. By the later reaction of the British government to the incident, the Soviets could ascertain whether or not Britain was cognizant of scalar electromagnetics. On April 2, 1978, an anomalous straight, not jagged, beam of "lightning" came down from the sky at a 45 degree angle to the ground and struck Bell Island, Newfoundland, causing a loud explosion and damage to some houses, etc. Two cup-shaped holes about two feet deep and three feet wide marked the major impact. Wires leading to a shed and coop nearby were vaporized. Both structures suffered considerable damage, but no burning occurred except for a slightly scorched spruce tree. The anomalous bolt did not discharge into prominent metal contact points, such as a metal chimney running down to an iron stove. Instead, all the wiring on the property was blown out. A number of TV sets in Lance Cove, the surrounding community, also exploded at the time of the blast. Weather men confirmed that atmospheric conditions at the time were not conductive to lightning. The blast was heard 45 kilometers away in Cape Broyle. Apparently U.S. Vela satellites picked up the event. The incident was investigated promptly by two representatives from a U.S. weapons laboratory at Los Alamos, according to the news media. On Nov. 21, 1977, cloud indications of a huge standing wave was observed off the Pacific coast of America, reaching from Alaska to Chile. Satellite photos show cloud banks over this stretch of the ocean, lying offshore, and reaching for the whole of the distance. These clouds grazed the land slightly at California. There a straight black line, as through drawn by a ruler, appeared in the cloud mass. It was an opening in the clouds, one mile wide and 200 miles long. There was no known explanation. This was a phenomenon without parallel in past records. A series of anomalous high altitude booms occurred off the East coast of the U.S. around the end of the year in 1977-78, though some activity had started as early as July 1977. Flashes associated with some of the booms were observed. On Dec. 27, President Carter called for a full report. No reason could be found. These explosions represented adjustment of the interference grid that had been established over the U.S. by the crossed Woodpecker beams, and artillery-type high burst registration of scalar EM howitzers. Numerous other adjustments of the grid and registration of howitzers have occurred over the U.S. The peculiar "nuclear flashes" seen by the Vela satellites in September 1979 and December 1980 could have been due to a testing of a scalar EM howitzer in the pulsed exothermic mode. In the mode, scalar EM pulses meet at a distance, where their interference produces a sharp electromagnetic explosion (hence the "flash", very similar to the initial EMP flash of a nuclear explosion. Even in the vacuum of space, such an explosive eruption of energy from within the local spacetime vacuum itself may be expected to lift matter from the Dirac sea, producing a plasma. Prompt absorption and re-radiation of energy from this sudden plasma may be expected to present nearly the same "double peak" profile as does a nuclear explosion. This was the profile presented by the flashes. Note that the second flash detected was apparently of an "explosion" primarily in the infrared, almost certainly ruling out a conventional nuclear event. It does not rule out, however, pulsed distant holography using pumped EM giant time-reversed wave transmitters. From Afghanistan in September 1979, British war cameraman Nick Downie observed gigantic, expanding spheres of light deep within the Soviet Union, toward the direction of Saryshagan missile test range. Saryshagan apparently contains at least one directed energy or particle beam installation which could possibly function as a scalar interferometer/scalar EM howitzer. Downie observed multiple incidents in the direction of Saryshagan during the actual month (September 1979) that the first anomalous flash was detected by U.S. Vela satellites. On the other hand, there also exists tenuous evidence that these Vela events may have been associated with weaponry of another nation, not hostile to the U.S. There is evidence that this second nation also possesses scalar EM weapons, as do two additional nations besides the Soviet Union. In latter 1980, a most anomalous drought was induced in the United States. "For the past four months, a single weather pattern has gripped virtually the entire United States, causing a coast-to-coast drought unique in the annals of weather recording... The weather system causing the drought is one of the most unusual national patterns ever recorded." It was also one of the most artificial ones ever recorded! On January 20-21, 1982 a swarm of more than 1,400 earth tremors occurred in that two-day period in north central Arkansas. Beginning on Jan. 12, activity had started in the swarm area, and three quakes registering above above 4.0 on the Richter scalar were recorded. The strongest was on Jan 20, and measured 4.5. There had been no previous recorded earth tremors in the area. Long dormant faults near the Ouachita Mountains were suspected as being responsible. Note that strong scalar waves, passing through the Ouachita fault zones, could have stimulated such activity, since a fault is a natural scalar interferometer and thus a scalar transmitter/receiver. Scalar reception would result in increased electricity in the rocks in the fault zone, in turn increasing the mechanical pressure in the rocks. Since the Soviets were heavily engaged in scalar EM weather engineering operations over North America in 1982, these tremors may have been side effects of those operations. On June 18, 1982, pilots and crews of Japan Air Lines Flights 403 and 421 reported sighting a giant, expanding globe of light in the North Pacific, 700 kilometers east of Kushiro. This was another test of a scalar EM howitzer/interferometer producing a "giant globular shell" of energy at a great distance. When small, the intense shell produces a very high EGP and also a very high EMP inside the matter of any object penetrating the shell. The EMP will dud any and all electronic equipment; explode high explosives, fuels, and combustibles; and render any modern weapon harmless. The high EGP will detonate a nuclear warhead immediately in a "full-up" nuclear detonation. It will also instantly kill any living creature, including every cell, bacterium, virus, and organism in its body. It will also detonate any ordinary, non-radioactive material with a low-order nuclear detonation of all its nuclei. As the globular shell is made very large, "energy density" in its shell is reduced. However, any nuclear material or device will still suffer a low-order nuclear detonation from the EGP, and any biological system will still be instantly killed. The EMP will still dud any electromagnetic equipment presently made. As can be seen, the globe can be used to defend an entire sector of the sky against any kind of incoming threat—with 100% effectiveness. A hemispherical shield can be placed over one’s own field army for terminal stage defense, and/or over the opposing force for initial phase defense, against most everything! On July 20, 1982, Soviet official Lysenko of the Soviet Embassy in Washington, D.C. stated publicly that, should nuclear disarmament fail, the Soviets would quickly introduce new weapons more powerful than nuclear arms, and these weapons would not be verifiable. U.S. Army Col. John Alexander, together with this author, was in the audience and heard Lysenko’s statement. Anomalous "laser blinding" of U.S. satellites over the Soviet Union has occurred on several occasions. On one occasion, a satellite was blinded for up to four hours. While such non-damaging blinding would be difficult for a ground-based laser to accomplish, it would be simple for a scalar EM interferometer—or a ground-based scalar EM laser—to accomplish, since the amount of energy deposited upon and within the satellite could be precisely controlled and even directly monitored. A possibly related anomalous temporary disabling of two or three power supplies has been demonstrated upon the British satellite Ariel 6 when passing over British Columbia or the Caspian Sea, if the sun is shining. On April 9, 1984 a gigantic mushroom cloud— glowing, like a "halo"—rapidly emerged from above the ocean off the coast of Japan. The cloud grew to 60,000 feet or so within two minutes, and reached an enormous diameter estimated at 200 miles. Several 80eing 747 jet airliners were in the general vicinity; at least one of them was piloted by a former B-52 pilot who took evasive action, since the phenomenon resembled a giant nuclear explosion. However, there was no blinding flash of light, and no massive shock wave overlook the aircraft. Walker et al investigated the seismic and underwater acoustic instrumentation data surrounding the period of the incident, and essentially ruled out all known natural phenomena. They concluded that the incident was either an as yet unknown natural phenomenon or man-made explosion. In fact, it was very probably a test of a giant scalar EM howitzer, used in the endothermic (heat energy withdrawing) mode. Sudden energy withdrawal in a region above the ocean resulted in a sudden low pressure, sucking up a giant cloud of moisture. Inrushing air pushed the cloud upward into a giant mushroom, much like a giant expanding thundercloud anvil wells up when it forms, only faster. Walker and colleagues have again examined the reported position of the cloud, and placed it much nearer to the Soviet Union— between the Kurils and Sakhalin. The diameter of the halo at maximum size is now estimated to have been at least 380 miles, and the altitude of its center (at maximum size) is estimated to have been greater than 200 miles. Note that the upper edge of the shell would have been at an altitude greater than 380 miles. This sort of "Tesla shield" is an antimissile and antiaircraft defense shield. Any object penetrating the shell receives both an electrogravitational pulse (EGP) and electromagnetic pulse (EMP) arising inside it, from within its local spacetime. The EMP will dud all electronics and explode all high explosive (HE) materials. EMI shielding is ineffectual, since the EM energy pulse arises everywhere within the vehicle, warhead, and circuitry from spacetime itself. The EGP will immediately fission radioactive material. If a strong EGP is experienced, a nuclear warhead or warheads will explode "full order", instantly. In fact, even the nuclei of ordinary, nonradioactive material struck by a strong EGP will fission in a low order nuclear explosion. As can be seen this defense weapon is effective against all types of warheads (nuclear, HE, etc.) and all types of penetrating vehicles (bombers, ballistic missiles, cruise missiles, RPVs, artillery shells, etc.). The 1968 statement in Voyennaya Strategiya (Military Strategy) by V.D. Sokolovskiy that 100 percent defense against missiles and aircraft is possible, and that this capability had been achieved by the Soviet Union, but not by the West, is true. The globular part of the exothermic test was very similar to the Soviet test observed from Teheran on June 17,1966. The glowing hemispherical shell was similar to several previous Soviet tests observe over the ocean and reported in the open literature. For example, on Mar. 24, 1977, the H.M.V. Kinpurnie Castle observed a large, moderately luminous hemisphere of light formed over the ocean, and the formation of two luminous patches or globes, one inside the hemisphere and one outside. The phenomena disappeared after 10 minutes. The gigantic incident off the coast of Japan on April 9, 1984 was indeed the testing of a giant Soviet scalar EM weapon. On the night of July 26, 1984, the pilot and crew of a Boeing 747 (American carrier) flying from Tokyo to Fairbanks, near the Kuril Islands, noticed a slowly expanding hemisphere of white light off to their left above the horizon. The shell of light continued to expand over a 10 minute period until ahead of them and to the right. The crew braced for a shock wave which never arrived. Their weather radar saw nothing out of the ordinary. The shell of light had sharp edges and was semitransparent so that stars became visible through it. This was another Soviet test of the Tesla shield. Numerous sightings of this phenomenon have been made by airline pilots flying in and out of Japan. In early December 1984, significant adjustments of the scalar EM interference grid occurred. In the vicinity of Los Angeles and San Diego, anomalous aerial phenomena such as explosions, rumblings, airquakes, and buildings and windows shaking without seismic disturbances occurred. A sharp and unexpected weather front appeared, racking the area with high winds on the night of Dec. 12, producing wide-spread damage and power outages. The newly-formed front, steered by the dynamic Soviet woodpecker grid, moved on to produce significant snowstorms in other areas;: even Tucson received a snow "dump" of 20 inches. Prior to the Dec. 12 anomalous weather front, this author accurately predicted an impending sudden drastic change in the weather in a brief interview over Radio station KABC, Los Angeles after the Dec. 8-9 anomalous aerial and ground structure disturbances. Complete explanation of Soviet weather engineering is given in Bearden, "Soviet Weather Engineering Over North America,"1985,1-hr. videotape. In January 1985, an incident of U.S. Navy-dispensed chaff drifting toward San Diego, California from off-coast was associated with significant failures of electrical systems and components in the city. Power was interrupted to as many as 60,000 homes. A specialized structure such as a piece of sophisticated chaff will reflect scalar waves of frequencies within its cut bandwidth. If scalar frequencies within the chaff bandwidth were present on the Woodpecker carrier grid above and surrounding San Diego, a myriad of reflecting bits of chaff in the moving chaff cloud would produce myriads of random, invisible "fireflies" of electromagnetic energy kindling at a distance, from randomized scalar interferometry, in a zone surrounding the cloud. As these "firefly" pulses of EM energy occurred inside components of the electrical system, interference would occur, leading to anomalous electrical failures. That is apparently exactly what happened. In February, 1985 a China Airlines Boeing 747 aircraft enroute to Los Angeles suffered anomalous engine flameout. The jetliner fell 32,000 feet, and the pilot finally managed to restart the engines and make an emergency landing in San Francisco. In the incident, different instruments apparently disagreed with each other, and disagreed with the observations of the pilot and crew. This is a direct indication of the test of one type of scalar EM weapon detailed in Fer-de-Lance. * Scalar interferometry (endothermic mode) causes electrostatic cooling in the internal combustion gases of the jet turbines. This reduces the pressure, and the thrust. When cooled sufficiently, the engines flame out and fail. They cannot be restarted until the scalar charge has time to drain away. We mention in passing that, in 1972, at a secret meeting of the leaders of the communist parties of Europe, Brezhnev named the year 1985 as the target year that the Soviets would be free to do as they will, anywhere on the globe. He stated that by that year the Soviet Union would control the oceans, the atmosphere, and 90% of the land area. We accent that he said control, not invade, conquer or occupy. In latter April, 1985, Frank Golden discovered the rather sudden Soviet activation of 54 powerful scalar EM frequencies (27 pairs, each pair 12 kilohertz apart) transmitted into the earth and utilized to stimulate the earth into forced electrogravitational resonance on all 54 frequencies. These represented 27 giant "power taps" into the earth, each tap extracting enormous energy from the molten core of the earth itself, and turning it into ordinary electrical power. Each giant tap is capable of powering 4 to 6 of the largest scalar EM howitzers possessed by the Soviet Union. In and around May Day 1985, the Soviets conducted a massive, "full up" strategy exercise of the scalar EM weapon systems and communications strategic exercise, monitored by Frank Golden (and for several hours, by the author.). For the May Day 1985 celebration, the 40th anniversary of the end of WWII, the Soviets conducted a full-up demonstration of the scalar EM superweapons armada for Gorbachev, the recently selected leader. Apparently over 100 giant scalar EM weapons were activated. Twenty-seven gigantic "power taps" were established by resonating the earth electrogravitationally on 54 frequencies (27 pairs where the two are separated from each other by 12 kHz.). By alternating the potentials and loads of each of the two paired transmitters, electrical energy—in enormous amounts—can be extracted from the earth itself, fed by the "giant cathode" that is the earth’s molten core. Scalar EM command and control systems, including high data rate communications with underwater submarines, were also activated on a massive scale. The exercise went on for several days, as power taps were switched in and out, and command and control systems went up and down. This exercise represented the achievement of Brezhnev’s 1972 statement that by 1985 the Soviets would be prepared to do as they wish, anywhere in the world. August 28, 1985. A Titan 34-D missile launched from Vandenberg Air Force Base blew up after launch. The loss has officially been attributed to failure of a high-powered fuel pump, causing a massive oxidizer leak and a smaller fuel leak. While the Soviets may have used a small EM missile to disable the pump, no evidence is available at this time to support that hypothesis. Note, however, that the loss date is well after the complete exercise of all the Soviet strategic weapons in late April-early May. It is also within the time of the "anomalous booms" accompanying full-up testing of the Soviet prelaunch ABM/antibomber system against shuttle launches from Cape Canaveral. The Soviets may very well have decided to test the first actual "quickest reaction time possible" destruction of a real, launched US. missile in August, 1985, followed by the decision to test the first actual "quickest reaction time possible" destruction of a real aircraft (simulated bomber) in December, 1985. Nov. 26, 1985. Launch of the shuttle Atlantis occurred in the evening at Cape Canaveral. A mysterious light was hanging in the sky; it was the marker beacon for registration of a Soviet prelaunch phase ABM/antibomber system. Just prior to launch, an EM missile strike occurred in the vicinity, as an offset test of an associated scalar interferometer in the exothermic mode. A photograph of the anomalous incident is highly suggestive of just such an EM missile. Twelve minutes after launch when the shuttle was safely down range and out of the way, a huge atmospheric, rumbling explosion occurred over the area, and was heard for hundreds of miles up and down the coast. This represented the test of the "multiple missile launch" kill mode of the weapon system. The marker beacon, seen by hundreds of persons, was photographed as it was slewed away by the distant Soviet operator. Many booms and rumbles have occurred over Florida for several years, as the Soviets adjusted and tested the various modes of the scalar EM grid weapon system. The shuttle launch on Nov. 26, 1985 was the third shuttle launch in which the giant explosion occurred over the area some minutes after launch. The Soviets were using the shuttle launches as a convenient simulation of a "missile target launch", against which to test their prelaunch ABM/antibomber system. It was a tragedy of enormous proportions, and especially to the families and friends of the brave servicemen and crewmembers who lost their lives. Three Canadian witnesses to the crash were interviewed over the Canadian Broadcast network television news on April 8, 1986 at 10:00 p.m. No flame or smoke issued from the plane before its descent and crash. However, the witnesses reported that the aircraft was mysteriously glowing with a yellow or orange halo. That is a signature of the use of a scalar EM howitzer in the "continuous EM emergence" mode, similar to the manner in which several F-111’s were downed in Vietnam. DC-8’s electrical systems were interfered with by EM energy and EM jamming noise created throughout each increment of spacetime occupied by the aircraft. A powerful charge was rapidly built up on the aircraft structures and skin. The "yellow glow" seen by the witnesses was a corona due to the skin of the aircraft acquiring a high electrical charge. The loss of the engines was probably due to the distant Soviet operator applying a localized endothermic (energy extraction) beam to the engines. In fact, one eyewitness actually saw the crossed, glowing beams form in the clouds and a ball or beam of light then go from that glow and strike the aircraft. Instant fire to the plastics inside the aircraft occurred, emitting deadly gases. Half the occupants died of cyanide inhalation before the aircraft struck the ground and exploded. The stricken airliner passed directly over one observer who heard its engines roaring in painful labor, rather than with the full-throated roar of normal power. On Jan. 28, 1986 the Challenger disaster occurred. The Challenger was positively killed by the Soviet Union, using the scalar EM weapons through the Woodpecker grid. A host of indicators occurred. On Apr. 18, 1985 a Titan 34-D missile, launched from Vandenberg Air Force Base, blew up 5 seconds after launch. Video cameras inadvertently caught the Soviet marker beacon, used with the scalar EM howitzer that destroyed the Titan, up and above the explosion, moving independently. Engineer Ron Cole personally examined the video frame by frame and asserted that the hovering ball of light was completely separate. This positive signature leaves no doubt that the Soviets destroyed that missile also. The previous Titan 34-D missile launch there in August, 1985 also blew up just after lift-off. On May 3, 1986 a NASA Delta rocket carrying a critically-needed weather satellite failed. The rocket suffered an anomalous "command-type" shutdown of its main engine during launch and began to veer off course, causing the range safety officer to destroy it. 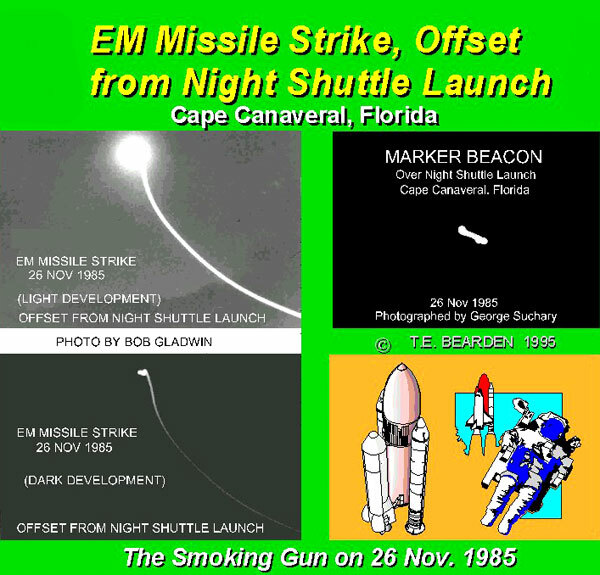 On a network video tape replay (several replays in succession), immediately after the loss of the rocket, this author observed that an anomalous light moved up from beneath the rocket and struck it, seconds before the destruction. Subsequent attempts to locate that particular videotape have met with failure. Several other persons were watching the replay with me at the time, and saw the anomalous light strike the rocket. The light plus the "internal command surges" are strongly indicative of time-reversed EM pulses and interferometry from a pumped phase conjugate mirror adjunct operating with an over-the-horizon tracking mode. In October, 1986, the Iceland Summit conference was held between Reagan and Gorbachev. The Soviets offered a breathtaking "zero-option" proposal, intended to lead to dismantling of most major strategic nuclear weapons, which would greatly ease the way to much more drastic employment of Soviet EM weapons. In short, if nuclear disarmament could be engineered, the U.S.’s "dead-man fuzing" against extensive employment of Soviet weapons would be almost eliminated. In that case, with its deployed, massive scalar EM weapons unleashed, the Soviet Union immediately holds the winning hand, and could rapidly proceed to dominate and control most of the earth. The Soviet offer was conditioned on the severe limitation of SDI to the laboratory, however, and Reagan balked at this. The reason for adamant Soviet insistence that the SDI genie must not be tested in space is that, should the U.S. develop scalar EM weapons—such as high energy scalar lasers—and deploy them as SDI modifications, the power would be enormously increased. * Their EGPs, however would detonate nuclear warheads and nuclear facilities. The resulting fallout would devastate the earth. Such a use would be suicidal. But it would be a first-strike weapon, if a madman pulled the trigger. If tested in space, prototype SDI launch and deployment vehicles would be available, even though the SDI system was not yet completed and deployed. In that case, the U.S. could possibly quickly launch several scalar EM weapons in retaliation for Soviet strikes against the U.S.—and from space even one weapon could destroy the Soviet Union. Thus, unless the SDI genie is chained up in the lab, a Soviet scalar EM initiative to dominate the world would involve unacceptable risk to the Soviet Union. At this writing, Gorbachev has mounted a great propaganda campaign to try to stimulate U.S. citizens, scientists, and political activists to demand nuclear disarmament, clearing out the U.S. dead-man fuzing. During the spring of 1986, abnormally strong Soviet weather engineering occurred over the U. S., causing a drastic drought in the southeastern U.S. This drought was broken by a colleague who used an extremely powerful scalar EM device to redirect jetstreams. Several national weathermen commented on this unusual pattern, which had not been observed before. The pattern continued, day after day, as the blocking continued. In latter October and early November, 1986, significant giant radial cloud patterns, associated with Soviet weather engineering using the scalar EM interference grid, were seen and photographed over California in the greater Los Angeles area. On Monday, Nov. 10, 1986 an anomalous, giant "fireball" was seen by hundreds of persons to move from west to east. It was seen over 4 states, and accompanied very sharp changes in the EM grid. An anomalous winter storm was in progress, with cold air spilling down from Canada. The storm penetrated very deeply southward, breaking cold records in a wide area of the mid-United States. At the same time, heat records were being broken in Florida, and generally throughout the southeast. Frank Golden verified by direct measurement that the electrogravitational field of the earth was agitated and most dynamic—in short, significant activity was being introduced by the Soviet scalar EM grid. (The activity was about half what it is when the Soviets are inducing an earthquake.). On Wednesday, Nov. 12, 1986, the author photographed three giant radial cloud patterns—one a "twin"—in Huntsville, Alabama, associated with the anomalous storm, now labeled the "Siberian express" on many news reports. On Thursday, Nov. 3, 1986 at Huntsville, the author observed another twin giant radial, gently moving along from west to east. At dusk, another single giant radial was observed at Huntsville. Also, air control radars along the corridor from Los Angeles to Arizona suffered a mysterious failure or "power outage" not long after the "meteor" incident. Reports were received from Montreal, Canada that anomalous TV interference was experienced in that area about the same time the air control radars experienced anomalous failure. This may show that the agent causing the radar failures and TV interference extended across a wide area of North America. Note that the normal intersection of the Woodpecker beams covers such a broad area of North America in the interference zone of the beams. The so-called "meteor" (actually, a large, rapidly moving light was seen and noise was heard) of Nov. 10 may well have been a large scalar EM ball from the Woodpecker grid weapon transmitters, performing a simulated test of the multiple-vehicle kill mode, using a large "electromagnetic missile" created and moved by the associated scalar howitzers. Complete explanation of the operation of these systems is contained in Fer-de-Lance and other books and papers. As this background summary is cutoff in mid November 1986, it does not include evidence of indications that exist for Soviet scalar EM enhancement or biological warfare against the West. The reader should be aware of the potential scalar BW threat, and the general lack of any effort to collate evidence in that area. For the present Soviet tactic, see the author’s "Glasnost: 29th Move of a 30-Move Chess Game," Raum & Zeit. in publication, and "Political Manipulation of Unified Field Theory," Raum & Zeit. in publication.